In this tutorial, you will learn how to use DJI Mobile SDK to access the media resources in the SD card of the aircraft's camera. By the end of this tutorial you will have an app that you can use to preview photos, play videos, download or delete files and so on. In order for our app to manage photos and videos, however, it must first be able to take and record them. Fortunately, by using DJI iOS SDK SDK, you can implement shooting photos and recording videos functionalities easily with standard DJI Go UIs. We use Phantom 4 and iPad Air as an example to make this demo. For more details of customizing the layouts for iPhone devices, please check the tutorial's Github Sample Project. Let's get started! Now, let's create a new project in Xcode, choose Single View Application template for your project and press "Next", then enter "PlaybackDemo" in the Product Name field and keep the other default settings. Once the project is created, let's import the DJI SDK and DJI UX SDK. In order to preview, edit or download the photos or videos files from the DJICamera, you need to use the DJIPlaybackManager or DJIMediaManager of DJICamera. Here, we use DJIPlaybackManager to demonstrate how to implement it. Now, let's create a new file, choose the "Cocoa Touch Class" template and choose UIViewController as its subclass, name it as "PlaybackViewController". We will use it to implement the camera playback features. Next, open the Main.storyboard file and drag and drop a new "View Controller" object from the Object Library and set its "Class" value as PlaybackViewController. Moreover, drag and drop a new "Container View" object in the PlaybackViewController and set its ViewController's "Class" value as DUXFPVViewController, which contains a DUXFPVView and will show the live video feed directly. 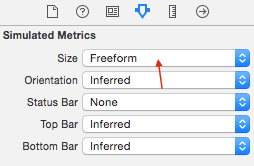 Furthermore, drag and drop a UIButton on the upper left corner and edit its text to "Back". Lastly, let's drag and place a UIButton on the bottom right corner of the DefaultLayoutViewController view and create a segue to show the PlaybackViewController when the user press the button. In the code above, we create an IBOutlet property for the playbackBtn and set its image in the viewDidLoad method. You can get the "playback_icon_iPad.png" file from this tutorial's Github Sample Project. In the viewWillAppear method, we firstly invoke the fetchCamera method of DemoUtility class to fetch the DJICamera object. Then invoke the setMode:withCompletion: method of DJICamera and pass the DJICameraModePlayback param to switch the camera mode to playback. 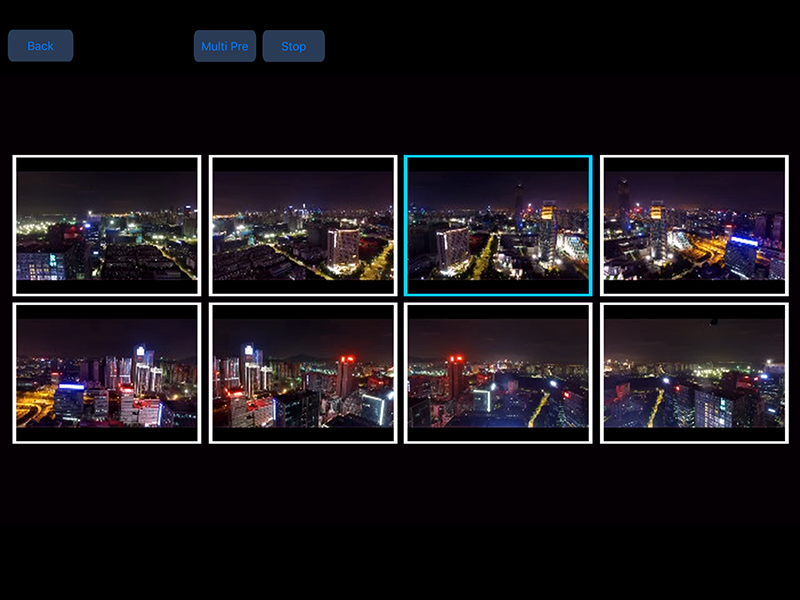 Similarly, in the viewWillDisappear method, we also invoke the setMode:withCompletion: method of DJICamera and pass the DJICameraModeShootPhoto param to switch the camera mode to shoot photo mode. So when the user enter the PlaybackViewController, the DJICamera will switch to playback mode automatically, when user exit back to the DefaultLayoutViewController, the DJICamera will switch to shoot photo mode. Since we can switch to the Playback mode now, let's add two UISwipeGestureRecognizers to preview the previous and the next media files in the SD Card. The above code uses the goToNextSinglePreviewPage and goToPreviousSinglePreviewPage methods of DJICamera's playbackManager to preview the next and previous files. Since there are two types of the media files in the SD Card, Photo and Video, we'll have to implement video playback feature as well. 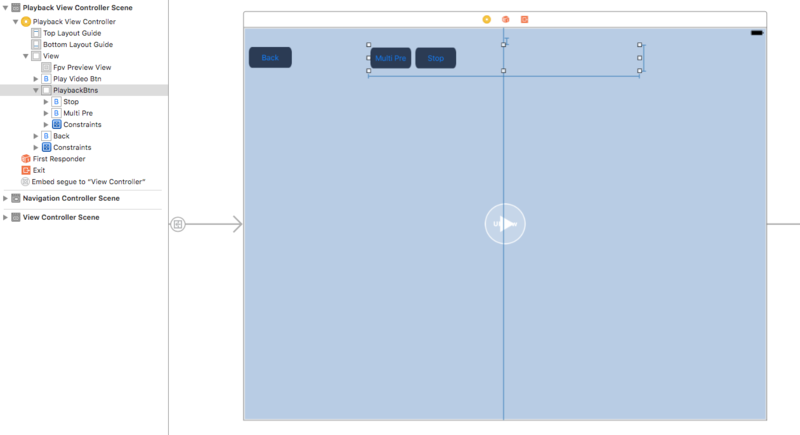 Open the Main.storyboard, drag a UIView object and position it on top of the viewController, then drag a UIButton to the view you just added as a subview and named "Stop". Next, drag a UIButton object to the center of the viewController, set its image as "playVideo"(You can get this image file from the project source code, in the Images.xcassets folder). As you can see, we have updated the cameraPlaybackState property's value in the - (void)playbackManager:(DJIPlaybackManager *)playbackManager didUpdatePlaybackState:(DJICameraPlaybackState *)playbackState delegate method, and have also updated the playVideoBtn's hidden state based on the DJICameraSystemState's mode and the DJICameraPlaybackState's playbackMode. In the playVideoBtnAction and stopVideoBtnAction methods, we check if the fileType is video, then call the playVideo and the stopVideo methods of the DJICamera's playbackManager to start and stop playing the video. For more details of the implementations, please check the tutorial's Github Sample Project. *  A playback mode represents a task that the Playback manager is executing. *  Single file preview mode. *  Single video playback start. *  Single video playback pause. *  Multiple media file preview. As shown in the code above, we can preview files in two ways: Single Preview and Multiple Preview. We can also play videos, delete photos and videos and even download them. You can preview at most eight files at the same time. Since the preview images are shown in the fpvPreviewView, you cannot interact with them yet. Let's add buttons and swipe gestures to interact with them. These buttons represent eight media files when you are in the Multiple Preview Mode. Pressing any of these buttons will enter Single Preview Mode. The first block is used to check the selected button action with index, the second one is used to check the swipe gesture action. These four swipe gestures are for single and multiple files preview. Swipe left or right to preview files in Single Preview Mode, swipe up or down to preview files in Multiple Preview Mode. We invoke the swipeGestureAction block inside the swipe action method with a UISwipeGestureRecognizerDirection value. We invoke the selectItemBtnAction block inside the IBAction methods with related button index. The index starts from 0 here because the file index counted in Playback Multiple Preview Mode starts from 0. Now, go back to "PlaybackViewController.m" file. Since we have added the swipe left and swipe right gestures in the "DJIPlaybackMultiSelectViewController.m" file, let's delete the swipeLeftGesture and swipeRightGesture properties and their related codes in the "PlaybackViewController.m" file to refactor the code structure. So in the initPlaybackMultiSelectVC method, we init the playbackMultiSelectVC property first, and then we invoke the selectItemBtnAction block's setter method and implement the toggleFileSelectionAtIndex method of the DJICamera's playbackManager with selected index. This way, we can switch to Single Preview Mode from Multiple Preview Mode. Furthermore, we invoke the swipeGestureAction block's setter method and implement the preview files feature based on the UISwipeGestureRecognizerDirection value. You can now preview photos and videos in Single Preview Mode and Multiple Preview Mode. But what if you want to delete a file you don't like? Let's implement the delete files feature! The above code implements the selectButtonAction method to enter and exit MultipleEditMode by calling the exitMultipleEditMode and enterMultipleEditMode methods of DJICamera's playbackManager. Then in selectAllBtnAction IBAction method, we use an if statement to check if all the files in the page are selected and invoke the selectAllFilesInPage and unselectAllFilesInPage methods of DJICamera's playbackManager. Here, we create an int property named selectedFileCount to count the number of files currently selected in the Multiple Preview Mode. We also create a UIAlertView property named as statusAlertView to show alerts when deleting files. The deleteButtonAction action method updates the selectedFileCount property value with cameraPlaybackState's selectedFileCount value. It then checks the playbackMode value of cameraPlaybackState to show alertViews in the DJICameraPlaybackModeMultipleFilesEdit and DJICameraPlaybackModeSingleFilePreview mode, then in the action handler, we invoke the deleteAllSelectedFiles and deleteCurrentPreviewFile methods of DJICamera's playbackManager to delete files and update selectBtn's title. Let's implement the download photo feature now. First, go to the Main.storyboard file and drag a UIButton object to the playbackBtnsView and name it "Download". Then position it on the right of "Delete" button. Lets briefly explain what each of these properties is for. *  Downloads the currently selected media files. *   The camera must enter multiple preview mode. *  @param prepareBlock Callback to prepare each file for download. *  @param dataBlock Callback while a file is downloading. The dataBlock can be called multiple times for a file. The error  argument in <code>DJIFileDownloadingBlock</code> is not used and should be ignored. *  @param fileCompletionBlock Callback after each file have been downloaded. *  @param finishBlock Callback after the downloading is finished. This method has three params, the first param prepareBlock is a file download preparing block. You can do some download initialization work here like showing an alertView to clarify the download file's file name, file size, etc. The second param dataBlock is a download data update block, you can append the downloaded data here and increase the downloaded size data. The third param fileCompletionBlock is a file download completion block, you can save the currently downloaded image to the Photo Album here. The last param finishBlock is a download completion block. Important: We cannot update the download file status UI in the dataBlock block, since it will slow down the file download speed. So we should use the downloadedImageData property to append downloaded data and use the updateImageDownloadTimer to update the UI. As you can see, we use the startUpdateTimer and stopTimer methods to start and stop the updateImageDownloadTimer. Then we implement the updateDownloadProgress selector method to update the statusAlertView's title and message value. In downloadButtonAction method, we update the statusAlertView's title and message. And create two new UIAlertControllers to ask users for permission to download files based on the cameraPlaybackState's playbackMode value. Also, in the action handler method, we invoke the downloadFiles method once the OK button of the alertView is pressed. *  Important: Don't update Download Progress UI here, it will slow down the download file speed. In the first block prepareBlock, we call the startUpdateTimer method to start updateImageDownloadTimer. Then, we update the totalFileSize and targetFileName variables. Next, we show statusAlertView and update its title and message with the download image info. In the second block dataBlock, we append the downloadedImageData with the downloaded image data and update the currentDownloadSize and downloadImageError variables' values. In the third block completion, we increase the downloadedFileCount variable. We then create an UIImage object with downloadedImageData. Next, we reset downloadedImageData's data and currentDownloadSize's value. Moreover, we update statusAlertView with the image download info. Now, we have implemented the download photos features, but if we want to save the downloaded photos to the iOS Photo Album? In the saveDownloadImage method, we check if the downloadedImageArray is empty and get its last UIImage, assigning it to the image variable. Then we use the UIImageWriteToSavedPhotosAlbum() method to save the image to the Photo Album and remove the last object from the downloadedImageArray. Next, in the selector method, we check if an error has occurred and invoke the saveDownloadImage method until the downloadedImageArray is empty. At the same time, we update the statusAlertView with related titles and messages. In this tutorial, you have learned how to use DJI iOS SDK to preview photos and videos in Single Preview Mode and Multiple Preview Mode, how to enter multiple edit mode and select files for deleting. You also learned how to download and save photos to the iOS Photo Album. Hope you enjoy it!